The proximity of Seattle and Vancouver, B.C., would seem to make a regional high-tech corridor a natural idea. A conference north of the border drew business and government leaders trying to build on that notion by forging stronger relationships. VANCOUVER, B.C. — Government and business leaders gathering here made much of the fact that Seattle and this northern neighbor city are separated by just a 140-mile drive. They share the same rainy climate, and growing high-tech industry. They lean politically liberal. Why not think of the two as inhabitants of the same region, rather than two metropolises competing across a national border? A conference Tuesday in downtown Vancouver, attended by more than 300 business and political leaders, marked the latest revival of what has been periodic efforts to build stronger relationships across the 49th Parallel. “There have been fits and starts” in linking the two economies over the years, said Brian Bonlender, director of the Washington State Department of Commerce. Still, to him, “this is the most substantive effort, with the most potential,” citing the involvement of the business community, academia and government. On Tuesday, that included a pledge from Washington Gov. 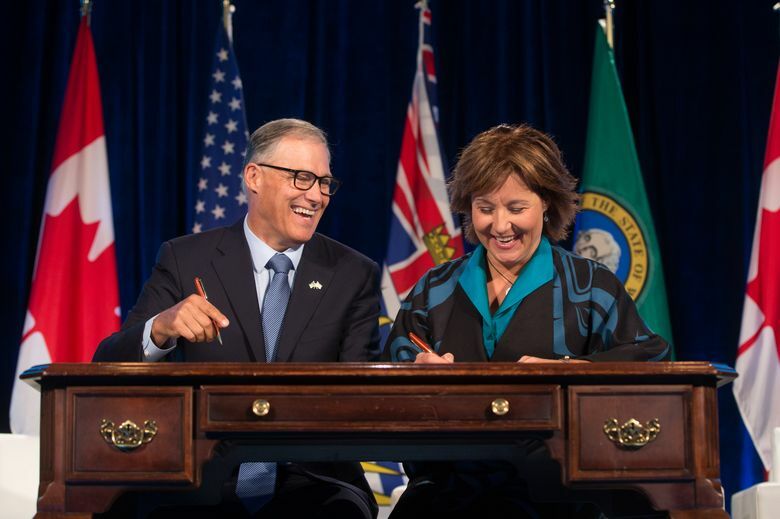 Jay Inslee and British Columbia Premier Christy Clark to work together on joint transportation, trade and research initiatives, and to hold a regional innovation-focused conference down the line. Both leaders portrayed the economies of Washington and British Columbia — historically focused on resource-extraction industries such as mining, agriculture and logging — as thriving because of their pivot toward high-tech work, including software and the life sciences. While the gathering was sponsored in part by industry groups on both sides of the border, it was primarily driven by Microsoft. The Redmond company has long flexed its muscles on regional and state issues in Washington, with President and Chief Legal Officer Brad Smith wearing hats both as a top advocate for the company’s interests and a prominent booster of the region. With Microsoft planting its flag in Vancouver at a new downtown office that has space for more than 700 people, Tuesday’s conference served as a coming-out party for a company keen to advertise its beefed-up local presence. “We’re in a position to help (the Cascadia initiative) take off,” Smith said in an interview. 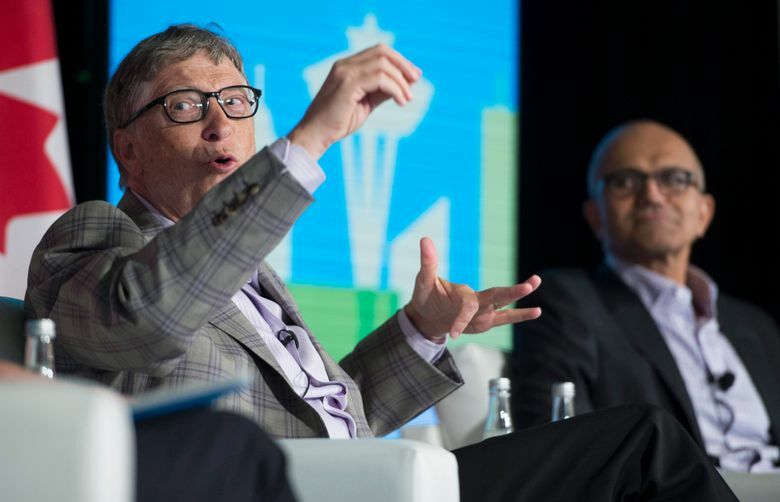 For the occasion, Microsoft co-founder and board member Bill Gates and CEO Satya Nadella made a rare public appearance together at a lunch event, fielding questions from Smith on a range of social and technology topics. Still, there are challenges to a unified Cascadia. The day started off with jokes about sporting loyalties — one Vancouver business leader professed his support for the Seattle Mariners. Another, like many in British Columbia, touted his love for Toronto’s Blue Jays, a team that plays most of its games on the other side of the continent. Those national, rather than pan-Cascadian, ties, play out among the business communities of both cities, according to a Boston Consulting Group study. Based on data from professional social-networking site LinkedIn, workers in Seattle are more likely to have connections with industry peers in Atlanta than Vancouver. By the same measure, Vancouver’s workforce has more in common with Ottawa than Seattle. Microsoft is aware of the distinctions that border brings. The company’s first software-development center in the Vancouver area, established in 2007, was set up amid executives’ frustration with a comparatively strict U.S. immigration policy that limits the number of visas available for skilled guest workers. Since then, Vancouver’s looser immigration laws have attracted development offices from other U.S. giants, including Amazon.com and data-visualization company Tableau, and helped build homegrown examples, like social-media software management company Hootsuite. A study by real-estate firm CBRE ranked Seattle the No. 3 North American market for technology talent; Vancouver checked in at No. 20. It’s natural to try to pile that together in a single marketing message to target the industries of tomorrow, business leaders here said. But the experience of some other pairs of cities that have tried a regional push — some of which are separated by much fewer than 140 miles — suggests the effort will be difficult, said Marek Gootman, who studies cities at the Brookings Institution.